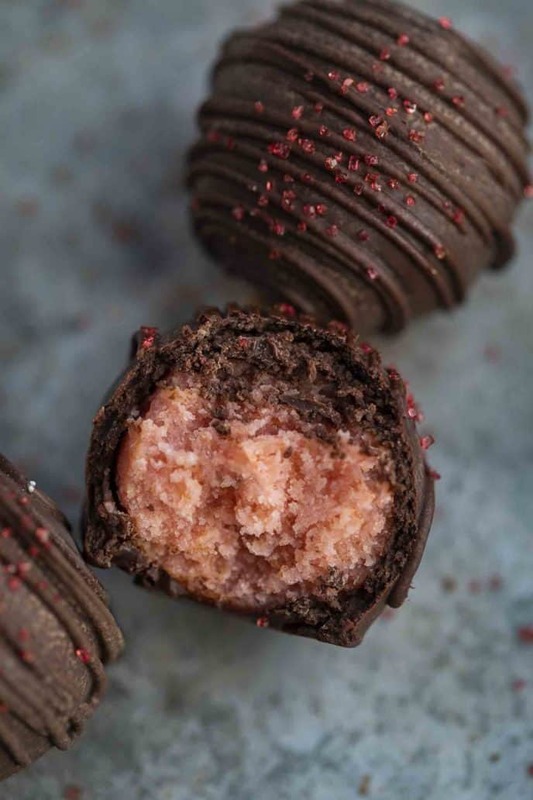 Strawberry Cake Balls made with ONLY 4 ingredients are sweet, creamy, coated in melted chocolate and incredibly easy to make! We’re getting our Valentine’s Day desserts ready, like these Oreo Balls, Chocolate Truffles, and Chocolate Lava Cake! Strawberry Cake Balls are a really simple dessert to make, made with strawberry cake mix, cream cheese frosting, chocolate melting disks, and red sanding sugar for decoration. 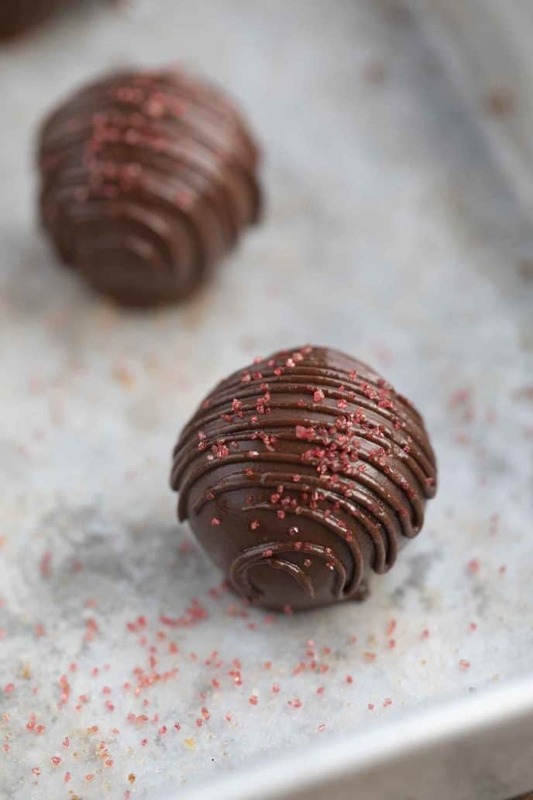 I like to use white chocolate and decorate with red sugar or sprinkles because I’m making these for Valentines Day, but you can use your favorite chocolate. These cake balls taste a lot like a combination of my two favorite desserts, strawberry cheesecake and cake batter, or even a creamy version of strawberry shortcake! These are made with prepared cake, so you can use any flavor you’d like. I use strawberry for Valentines Day, or vanilla and funfetti for birthdays! Strawberry cake balls will keep in the refrigerator for 1-2 weeks, when sealed tightly in an airtight container. 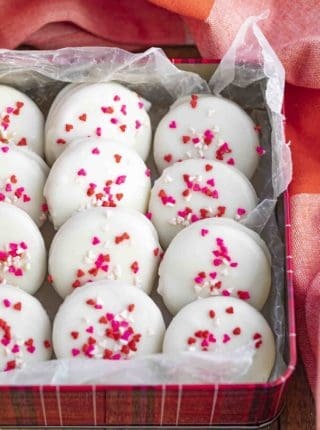 Layer these cake balls with parchment or wax paper, so they don’t stick together. We are refrigerating these because we’re using cream cheese frosting, which is dairy-based. If you use a different frosting, you can keep these at room temperature. WHAT ELSE CAN I DECORATE STRAWBERRY CAKE BALLS WITH? 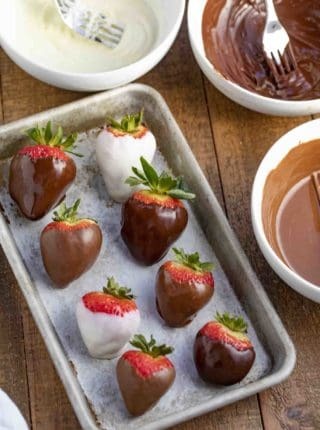 Dip the head of a lollipop stick in the melted chocolate or extra frosting, then into the middle of one of the strawberry cake balls to make strawberry cake pops. You can use any cake or frosting to make a cake ball. Try vanilla cake, red velvet cake, or chocolate cake! If the cake and frosting mixture sticks to your hands, dust your hands with powdered sugar before rolling the balls. Add a few drops of coconut oil to the chocolate to smooth it out, if you need it. Make sure you bake your strawberry cake according to the directions. If you over bake, the cake will be dry and it will be difficult to roll a smooth cake ball. Try using a small ice cream scoop to scoop out the cake balls, this will help them all be the same size. Use lemon cake to make lemon cake balls, and sprinkle with lemon zest. 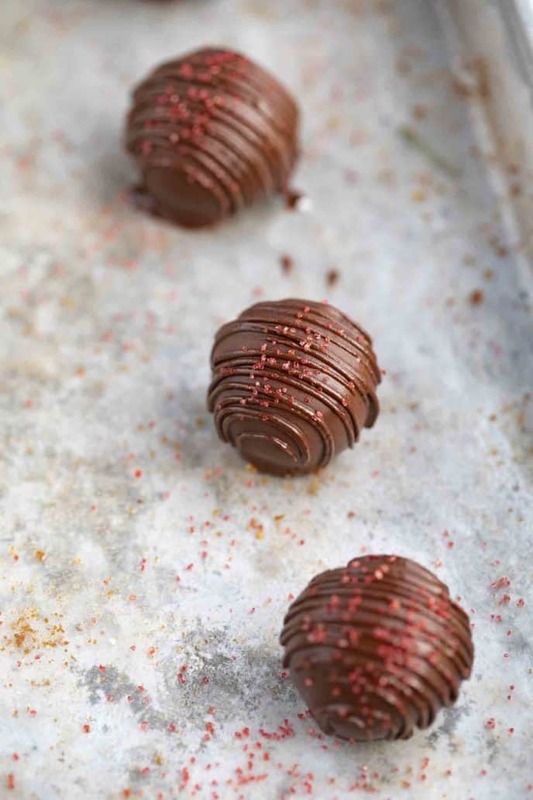 You can use white chocolate, almond bark, milk chocolate, or dark chocolate disks to coat these strawberry cake balls. I don’t like to use chocolate chips, because the chocolate won’t turn out as smooth. Cut fresh strawberries in to pieces and form the cake balls around the strawberry, for a fruity center. Serve these in mini cupcake cups for decoration and to make it easier for guests to carry them around. I use my cream cheese frosting with the strawberry cake, because it gives the inside of the cake ball a nice pink color. 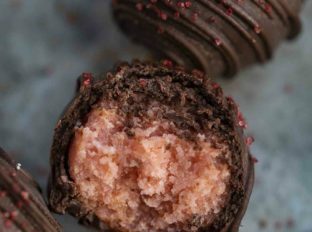 You can use chocolate frosting if you’d prefer to make dark chocolate strawberry balls but they won’t be pink on the inside. Break the strawberry cake apart into crumbs and mix with the cream cheese frosting before refrigerating for at least 2 hours. Scoop into 1 tablespoon sized balls and roll quickly before refrigerating a second time. Melt the chocolate disks in a microwave safe bowl in 30 second increments until completely smooth then dip the cake balls on a fork and quickly tap off the excess chocolate and place on a parchment paper lined baking mat. 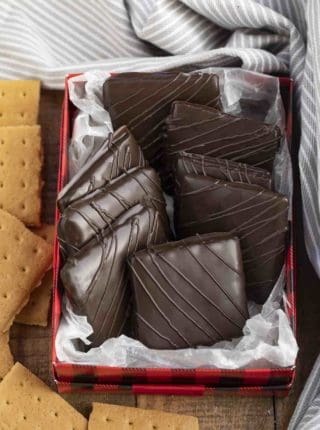 Use the excess chocolate to place in a ziplock bag, snip a tiny edge off the bag and pipe chocolate in a zig zag pattern on the cake balls before garnishing with sanding sugar. These would be perfect for that! Enjoy! I am craving these just looking at those close ups! What a perfect treat to make for someone special or myself! Love all the tips that you have in here too! Thanks for the 5 stars, Karen! Yes!! Little hands kept trying to come in and swipe them off of the table, haha! These look A-mazing! Great teacher/friend/coworker/self gifts for Valentines Day! Such a sweet idea! I hope they enjoy them! I love these little treats! The perfect sweet treat to give to your Valentine! Sabrina, I love this idea. I only recently learned how cake pops were made and the possibilities are just endless. Great idea for Valentines Day! 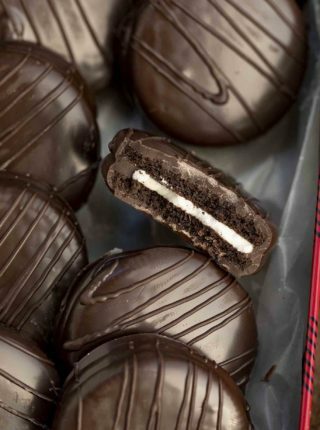 I can’t wait to make these for Valentine’s Day! Haha, they seem to have that affect on many!